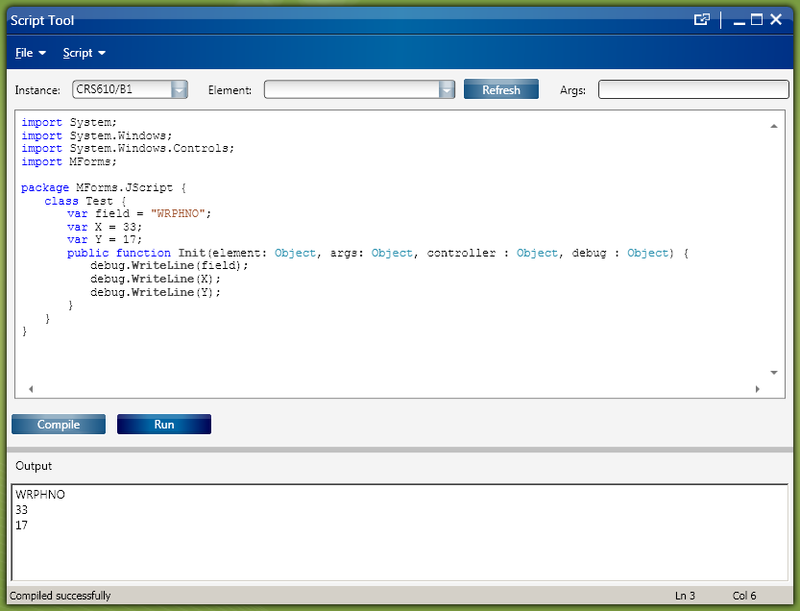 Here is a trivial solution to implement Personalized Scripts for Lawson Smart Office that self-configure based on the program they are being executed in. 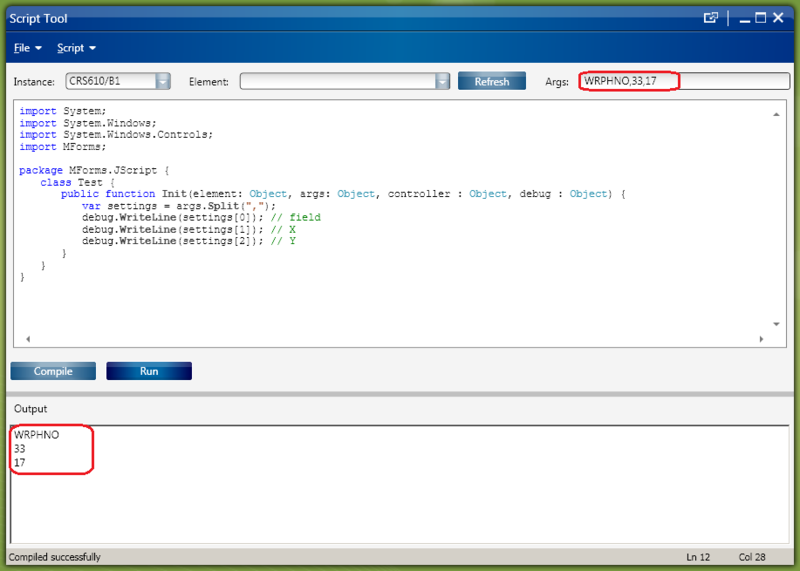 We often implement scripts which functionality can be applied to different M3 programs. For example, a script that makes a phone call based on the phone number displayed on the screen could be applied to any M3 program that has a phone number (Customers, Suppliers, etc.). As another example, a script that shows an address on Google Maps could be applied to any M3 program that has an address (CRS610/E, CRS622/E, etc.). 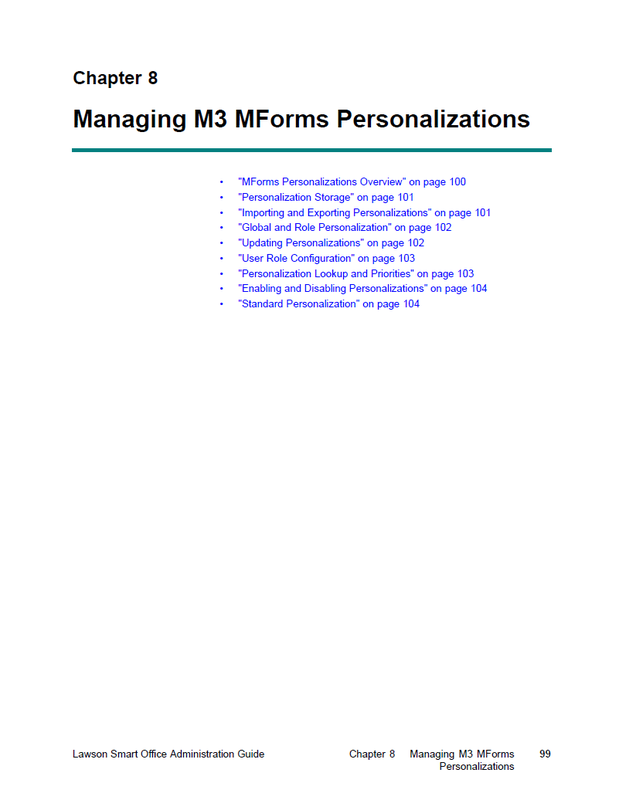 We could make one copy of the script for each target M3 program, but that would be a maintenance nightmare. We could make the script re-usable and pass settings to the script, but that would require the installer to manually define the settings, which is time consuming and error prone. As a general problem, I want to make a script re-usable and with zero configuration so it can be used anywhere in M3 where its functionality is needed. The trivial solution is to pre-compute all the possible settings in advance, and apply the corresponding settings at runtime. We dynamically determine in which program we are currently executing the script by reading the HostTitle variable. I call it a self-configuration script. The advantage is reduced installation. In some cases we could completely eliminate configuration. It’s also time saving, and error proof. And it’s closer to plug’n play and Autonomic Computing. 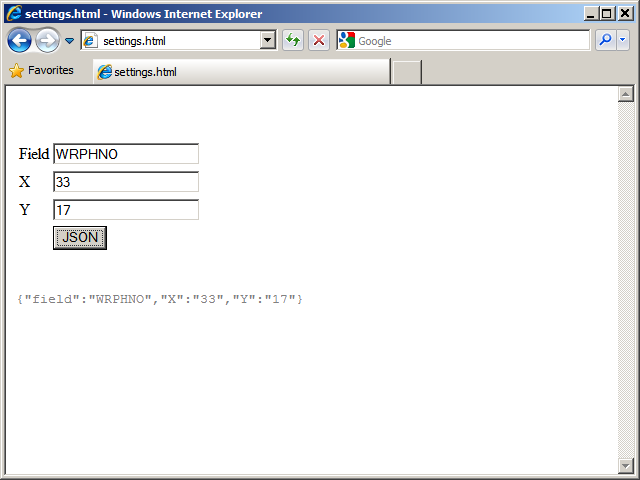 I had implemented a script that performs address validation. The script checks the address that is entered by the user with a third-party software that validates if the address is correct or not. The script needs to get a reference to the address fields: Address line 1 (CUA1), Address line 2 (CUA2), City (TOWN), State (ECAR), etc. In CRS610/E those fields will be WRCUA1, WRCUA2, WRTOWN, and WRECAR. Whereas in CRS622/E those fields will be WWADR1, WWADR2, WWTOWN, and WWECAR. The fields are different in each M3 program. So I pre-computed the field names of the eight M3 programs and panels where I would be executing the script (CRS610/E, CRS235/E1, CRS300/E, CRS622/E, MNS100/E, OIS002/E, OPS500/I, and SOS005/E), and I hard-coded all the possible values in the script. 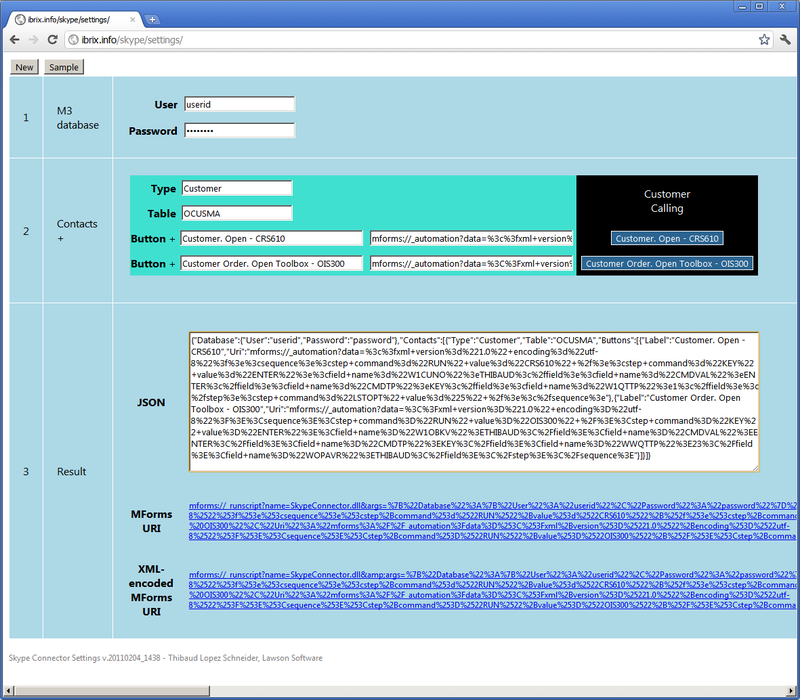 This has been tested in Lawson Smart Client (LSC), and in Lawson Smart Office (LSO). In this post I discuss several techniques to pass settings to a Personalized Script for Lawson Smart Office. Suppose we have three settings: field, X, and Y that we want to pass to a script with the respective values WRPHNO, 33, and 17. The question is how do we pass those settings and their values to the script? I can think of five techniques: 1) hard-code the settings in the source code, 2) use comma separated values and String.Split, 3) use JSON, 4) use XML, or 5) use Java Properties or .NET Resource files. 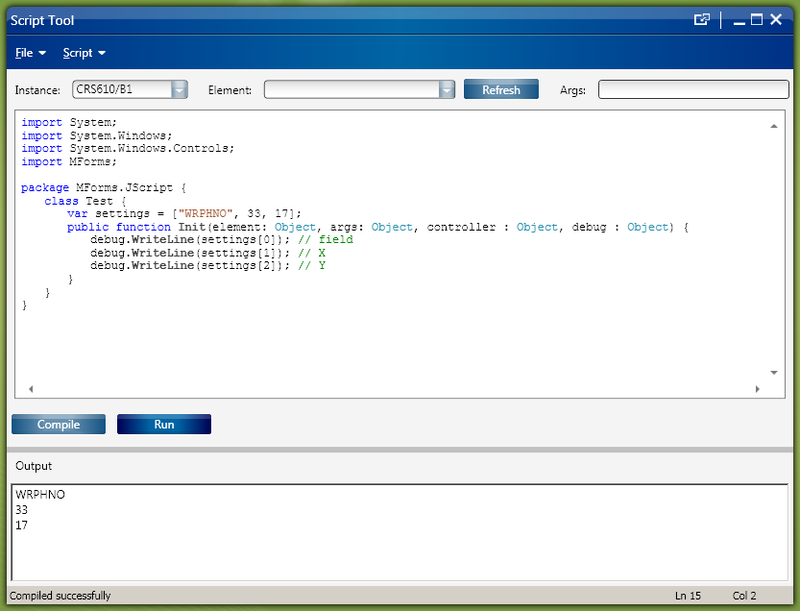 The fifth technique is to use Java Properties files or .NET Resource files, but I couldn’t find a concise solution that fits in only a couple of lines of code; it seems to require many lines of code. 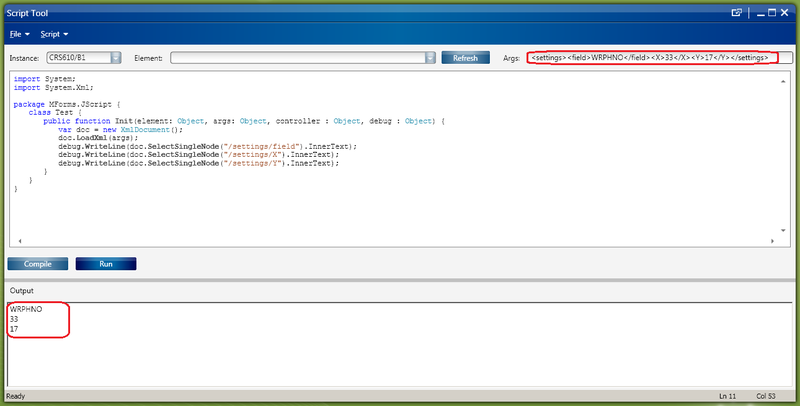 UPDATE 2012-12-14: I would copy/paste my properties file to the Smart Office installation point folder on the web server, and refer to it from the script as http://smartoffice/LSO/thibaud.properties using standard .NET classes to read files. If you have an example let me know and I can post it here. The hard-coded values are simple to implement for the developer, but it makes the script non reusable by nature, and it invites a risk of corruption when the administrator has to manually edit the source code to change the settings. The comma separated list of values and String.Split is also simple to implement for the developer, but maintenance is inversely proportional to scalability: the more settings we add the harder it becomes to identify which value is located where in the string. Also, if by mistake a comma goes missing the whole settings are compromised. Using JSON is great because of the possibilities to validate the JSON object with JSlint and JSONLint. Also, it’s scalable: we can store a large number of settings in complex structures like in sub-settings or in a tree of settings and still maintain readability. 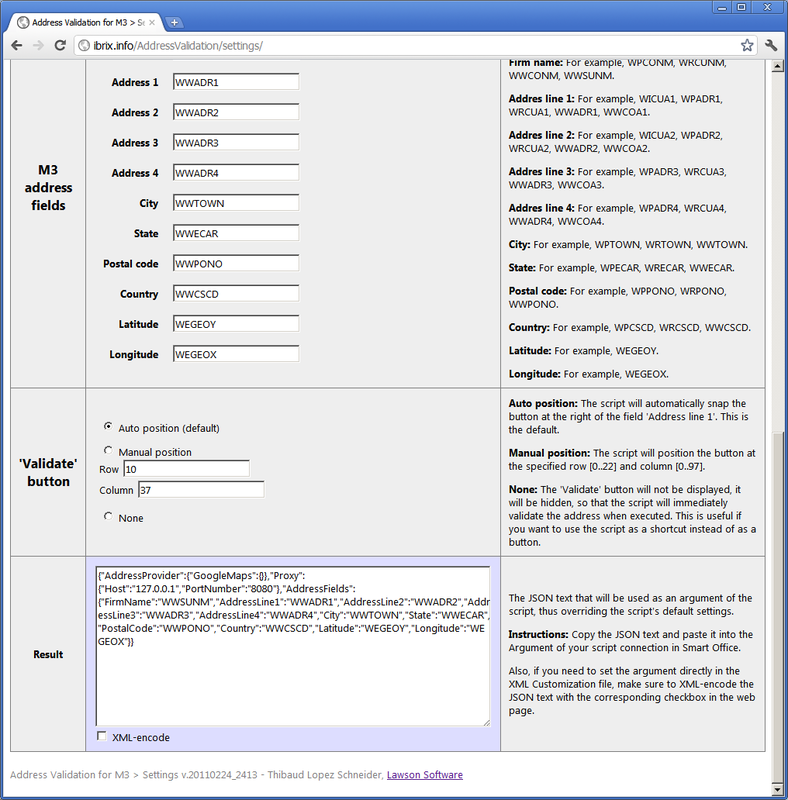 Using XML is great for all the advantages of XML, like editing tools and semantic validation. I encourage implementing a settings page as an HTML form for the administrators to easily configure the script and save the settings in the XML Customization file in Smart Office. The JSON object is provided as a JS file by Douglas Crockford here, and it is also natively supported in modern web browsers like Microsoft Internet Explorer 8 and in Google Chrome. Once the settings are generated, either as a comma separated list of values, or as JSON text, or as XML, we can save the result in the argument attribute of the Customization file in Smart Office. 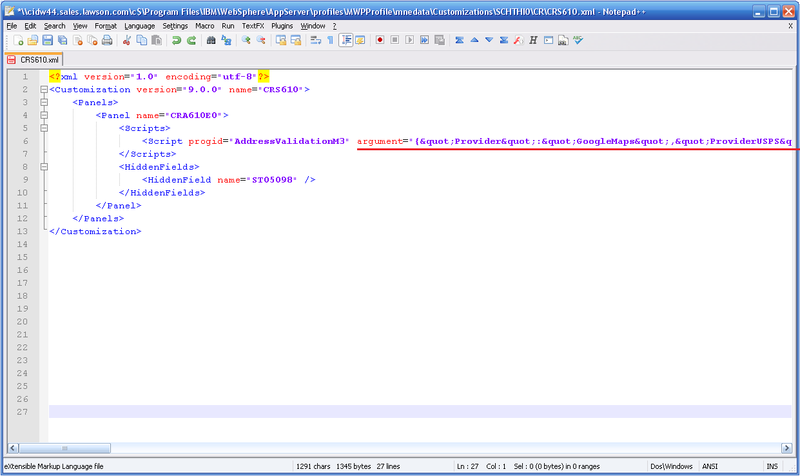 The value must be XML escaped with for example this online tool.